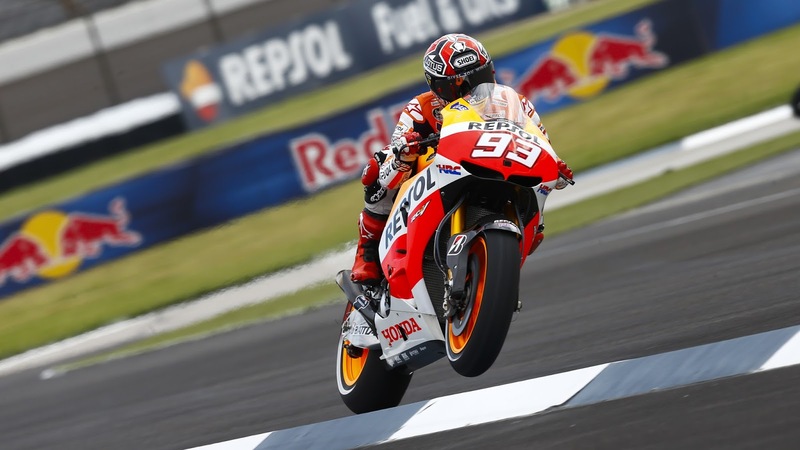 Marc Marquez led a Repsol Honda Team one-two in Friday’s second free practice session for the Red Bull Indianapolis Grand Prix. 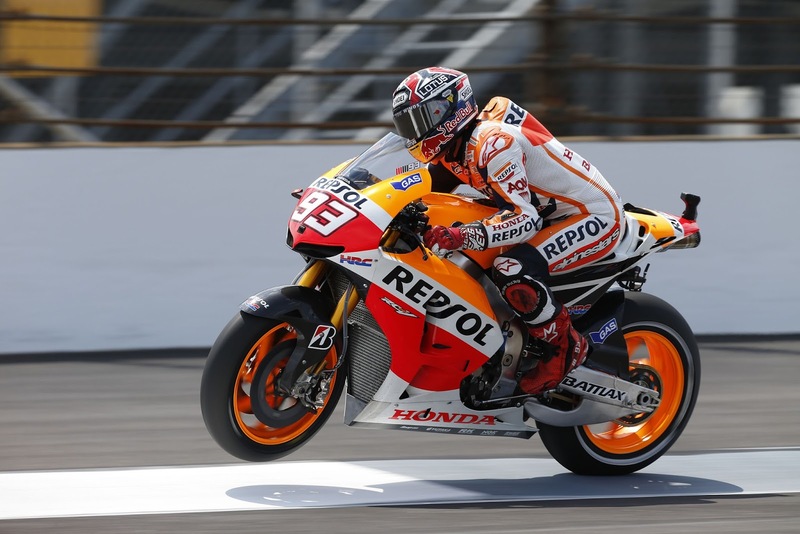 The championship leader, who had already topped the morning period, maintained first position into the afternoon as teammate Dani Pedrosa and LCR Honda MotoGP’s Stefan Bradl joined him inside the top three. 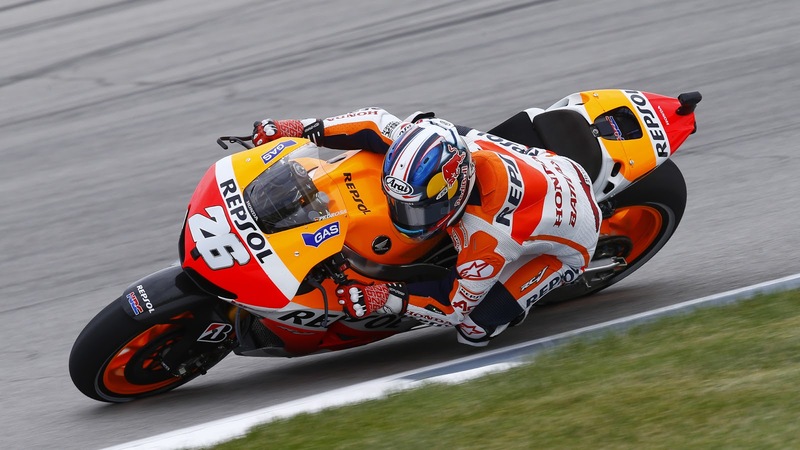 As Marquez reduced the leading time to 1’39.502, Pedrosa – who briefly held P1 himself – was denied by less than one tenth of a second. Bradl – who suffered a fall this afternoon – jumped ahead of World Champion Lorenzo in the closing moments, who in-turn pipped Monster Yamaha Tech3’s Cal Crutchlow to fourth place. On the second Yamaha Factory Racing machine, Lorenzo’s teammate Valentino Rossi rounded out the first group of six. 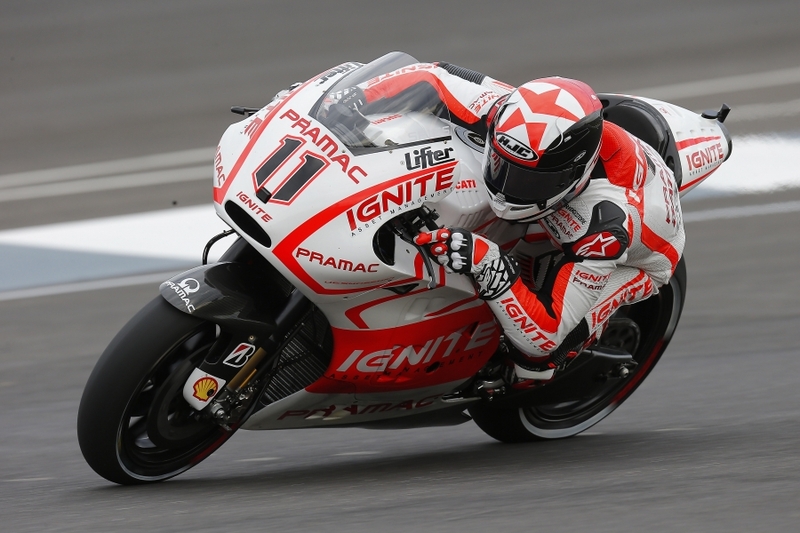 There was a welcome return to action for Ignite Pramac Racing’s Ben Spies, all set to start his first race since Austin. The American ended the day in 13th place, whereas Energy T.I. 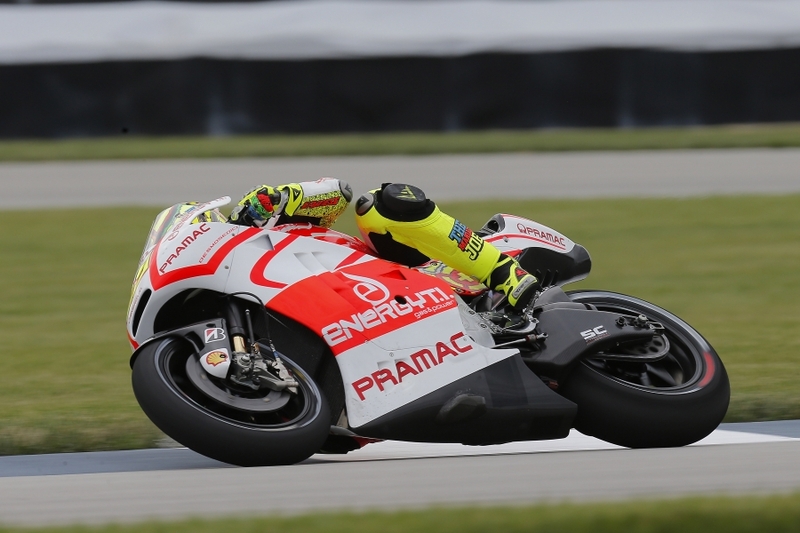 Pramac Racing entrant Andrea Iannone was 14th and also making a return to the championship from injury. Ahead of them, positions seven to ten were occupied by Alvaro Bautista (GO&FUN Honda Gresini), Bradley Smith (Tech3) and Ducati Team duo Nicky Hayden and Andrea Dovizioso. The field was completed by wildcard rider Blake Young (Attack Performance Racing), while Cardion AB Motoracing’s Karel Abraham was declared fit to continue competing despite suffering contusion of his left shoulder and left foot in a heavy highside crash during the first session; the Czech finished the day in 22nd position. There was a brief red flag stoppage in the afternoon when a marker became dislodged on the entry to Turn 1 – this was swiftly removed by the marshals. 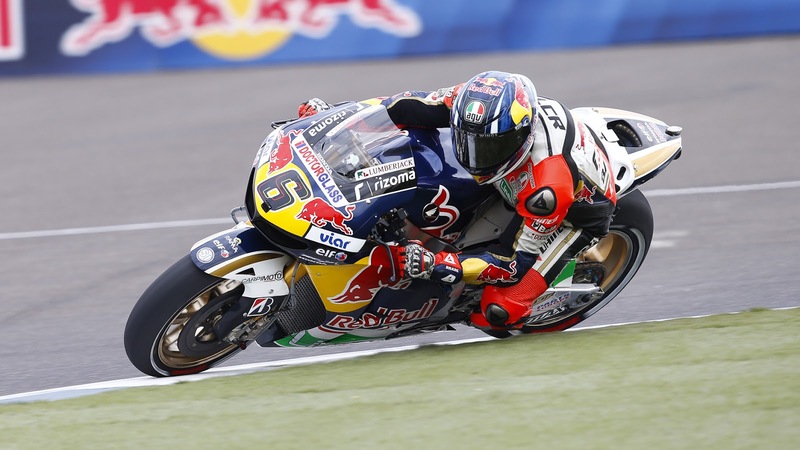 Simone Corsi moved atop the timesheets as Moto2™ practice commenced at the Indianapolis Motor Speedway on Friday. After a flurry of last-minute lap time improvements, the NGM Mobile Racing rider led championship leader Scott Redding (Marc VDS Racing Team) and Tito Rabat (Tuenti HP 40). After finishing fourth in the morning, Corsi continued his consistent day to lead with a best effort of 1’43.683. Redding – who at the end of the second session briefly set the pace for the first and only time of the day – ended proceedings almost three tenths of a second slower, while third-placed Rabat narrowly edged out Came IodaRacing Project’s Johann Zarco and Maptaq SAG Zelos Team’s Marcel Schrotter. In sixth was Takaaki Nakagami, who had led the opening period for Italtrans Racing Team. The talking point of the day was arguably the huge highside from which Pol Espargaro escaped unscathed. The title contender lost the rear end of his Tuenti HP 40 machine at the final corner, with the bike soon cartwheeling towards, but missing, its errant rider who was miraculously able to ride it back to the pit lane for repairs. The Spaniard would finish the day in 15th position, having during the summer break signed a MotoGP™ contract with Monster Yamaha Tech3 for next year. Mike di Meglio was in the wars in the final minutes, sliding his JiR Moto2 bike off-track at Turn 10, as American wildcard rider James Rispoli completed the day in 28th spot for GPTech. 31st fastest of the 33 runners was Thitipong Warokorn for Thai Honda PTT Gresini Moto2, permanent replacement for fellow Thai countryman Ratthapark Wilairot who has now retired from Grand Prix motorcycle racing. 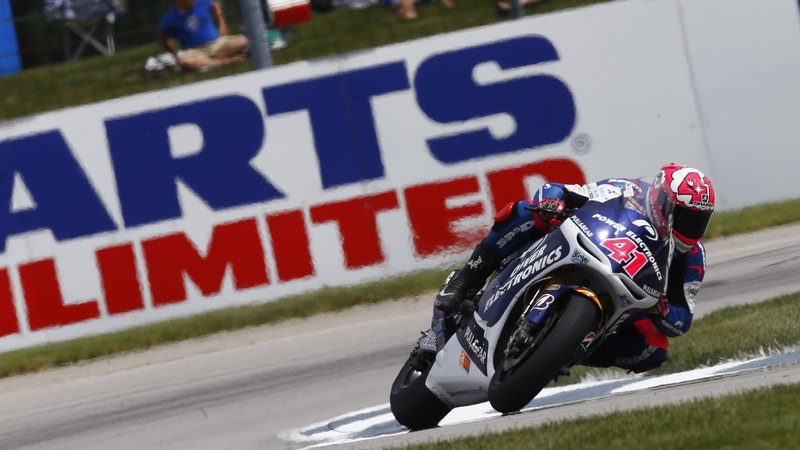 Maverick Viñales has set the pace at the end of the Moto3™ summer break, topping Friday’s practice for the Red Bull Indianapolis Grand Prix. The Team Calvo rider led the way from San Carlo Team Italia’s Romano Fenati and Estrella Galicia 0,0’s Alex Marquez. Jack Miller (Caretta Technology – RTG) would lead the way for much of the session, but a late flurry of lap times would demote the Australian to an eventual fourth position. For Viñales, his lap time of 1’48.502 becomes the new Moto3™ benchmark at the legendary Motor Speedway, edging out Fenati’s last-gasp effort by just 39 thousandths of a second. With Marquez third quickest, he and teammate Alex Rins – winner of the last race in Germany – sandwiched Miller into fourth spot. Mapfre Aspar Team Moto3’s Jonas Folger, who had topped a rain-affected first period in the morning – ended the day in sixth place, narrowly ahead of championship leader Luis Salom (Red Bull KTM Ajo). In opening practice, Ana Carrasco (Team Calvo) had become the first faller of the day, whereas during the afternoon there were incidents for Toni Finsterbusch (Kiefer Racing), Niccolo Antonelli (GO&FUN Gresini Moto3), the aforementioned Miller and Miguel Oliveira (Mahindra Racing). At Ambrogio Racing, France’s Jules Danilo is riding in place of Danny Webb who is no longer with the team. A permanent replacement rider is yet to be named. 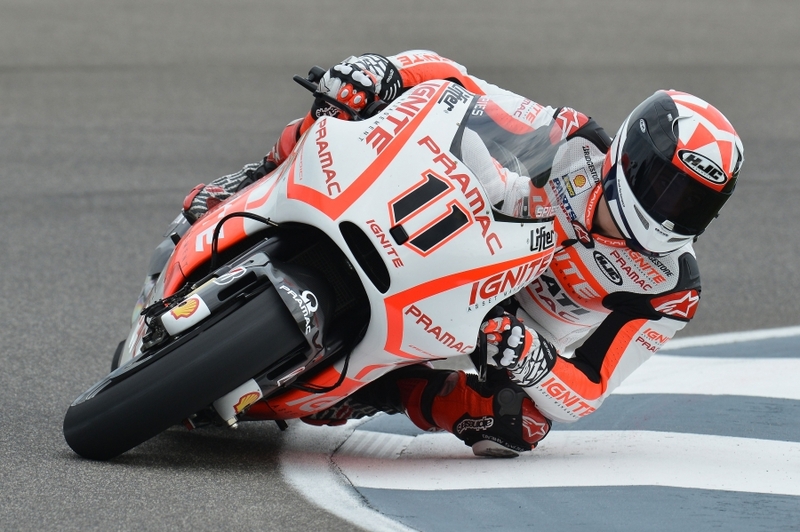 The Indianapolis GP weekend ended with a 2nd-3rd degree dislocation of the acromioclavicular joint in his left shoulder, suffered in a turn-four crash approximately midway through the third free-practice session. Fortunately, Spies’ right shoulder, which recently underwent a long rehabilitation process, wasn’t injured in the fall. On Monday, the Texan will undergo additional, more thorough exams, after which it will be possible to better understand the necessary recovery time. On the final lap of this morning’s free-practice 3, at which point direct transfers to Q2 are decided, Andrea Iannone was bumped to eleventh place by just .017 seconds by fellow Ducati rider Nicky Hayden. The Italian will therefore participate in the Q1 session. Team Interwetten Paddock-Star Tom Lüthi hat die Grand Prix-Sommerpause von nahezu fünf Wochen gut genutzt und beim Muskelaufbau und Beweglichkeitstraining seines lange verletzten rechten Oberarms weitere, große Fortschritte gemacht. Am ersten Trainingstag zum Grand Prix von Indianapolis auf dem legendären „Brickyard“ war er fast vollständig fit, hatte beim Fahren kaum Beschwerden und tankte viel Zuversicht für die zweite Hälfte der Saison. Fehlte dem 26jährigen aus Oberdiessbach/Schweiz auf Platz zehn am Vormittag noch eine knappe Sekunde auf die Bestzeit, so konnte er sich am Nachmittag auf Rang sieben steigern, wobei er seinen Rückstand auf den Italiener Simone Corsi an der Spitze auf 0,7 Sekunden reduzierte. In der Addition beider Trainingsläufe belegte Lüthi am Ende den achten Platz. Dass nicht nur der Fahrer, sondern auch seine Suter MMX2 in guter Form ist, bewies die Lichtschranke: Lüthi erreichte als Schnellster seiner Klas se einen Topspeedwert von 279,5 km/h. Der Arm fühlt sich sehr gut an auf dem Motorrad. Indianapolis ist wieder eine Strecke, auf der es ziemlich viel linksherum geht. Vor allem die Bremsphasen sind links, und das kommt mir entgegen. Jetzt, nach der langen Sommerpause, spüre ich vor allem den linken Arm, denn es muss sich alles erst wieder einlaufen. Doch mein lange verletzter rechter Arm macht wirklich gut mit. Die Heilung hat in der Sommerpause weitere, deutliche Fortschritte gemacht, was mich sehr freut und aufbaut. Was die Abstimmung fürs Rennen angeht, konnten wir heute schon recht gut arbeiten, doch es fehlt noch ein Stück. Ich war schon ziemlich am Limit, meine Rundenzeit war aber trotzdem noch nicht schnell genug. Natürlich wird die Strecke selbst noch schneller, je mehr Gummi wir auf dem Asphalt liegen lassen, denn es war in letzter Zeit wenig Rennbetrieb hier im Infield von Indianapolis. Gleichzeitig müssen wir uns abe r auch mit dem Motorrad noch verbessern. Im freien Training am Samstagmorgen wollen wir auf jeden Fall einen Schritt vorwärts machen. Mein Ziel für die Qualifikation am Nachmittag ist es, in die ersten beiden Startreihen vorzustoßen. Es wird nicht einfach, das ist mir bewusst, doch das ist unser Ziel! 1. Simone Corsi/ ITA / Speed Up / 1:43.683 min. 2. Scott Redding / GBR / Kalex / + 0.294 sek. 3. Esteve Rabat / SPA / Kalex / + 0.339 sek. 7. Tom Lüthi / SUI / Suter / + 0.719 sek. Für Kiefer Racing verlief der zweite Tag des GP von Indianapolis, dem 9. Lauf zur Motorrad-Weltmeisterschaft der Moto3 Klasse sehr positiv. Florian Alt steigerte sich nach seinem schon guten Abschneiden am Freitag noch mal und liegt in der Startaufstellung nur 2,2 Sekunden hinter der Spitze. Somit belegt er den 25. Platz, sieht dem Rennen aber zuversichtlich entgegen. Toni Finsterbusch konnte seinen gestrigen Tag aus dem Gedächtnis streichen und fand heute mit jeder Runde wieder mehr Vertrauen zu seinem Motorrad. Er geht vom 28. Platz aus ins Rennen. Nachdem sich Florian, als Neuling in Indianapolis, gestern mit der für ihn neuen Strecke anfreundete legte er am heutigen Tag noch eine Schippe drauf. Er arbeitete heute konsequent an der Rennabstimmung und fuhr am Nachmittag ein sehr konzentriertes Qualifying. Seine Zeit ist zwar nicht weit vom 15. Startplatz entfernt, aber er nimmt sich die ersten Punkteränge noch nicht als Ziel. Ein solides Rennen mit seinem Rennspeed den er sich erarbeitet hat wird es zeigen wie weit er es nach vorne schaffen kann. Toni Finsterbusch, sein Teamkollege, fand im Qualifying auch immer besser zu seiner alten Form. Er hat sich vorgenommen im Rennen voll zu pushen. 1. Alex Rins / SPA / KTM / 1:47.392 min. 2. Alex Marquez / SPA / KTM / + 0.294 sek. 3. Maverick Vinales / SPA / KTM / + 0.477 sek. 25. Florian Alt / GER / Kalex-KTM / + 2,234 sek. 28. Toni Finsterbusch / GER / Kalex-KTM / + 2,666 sek. Yamaha Factory Racing riders Jorge Lorenzo and Valentino Rossi were on track today for the first practice session of the weekend for the Indianapolis Grand Prix on Sunday. After a summer break shortened by a two-day private test at Brno this was the first opportunity for both riders to shake off any cobwebs and get back into a riding rhythm. Lorenzo continues to improve his fitness following his two collarbone surgeries earlier in the season. The reigning world champion finished the morning practice in third, 0.480 seconds from first then went on to wrap up the afternoon session in fourth, having closed the time gap to first to just 0.263 seconds. Rossi also made improvements between the two sessions. The nine-time world champion completed the morning session in fifth place 0.766 seconds from the front then worked hard to shave time off in the afternoon, finishing sixth with a gap of 0.582 seconds to first. The second half of the 2013 MotoGP World Championship got underway at the world famous Indianapolis Motor Speedway today, with Monster Yamaha Tech 3 riders Cal Crutchlow and Bradley Smith making an impressively fast return from a well deserved summer break. Refreshed and raring to go after spending the three-week break relaxing in America, Crutchlow and Smith wasted no time in getting back in the groove on their YZR-M1 machinery to lap inside the top eight today. 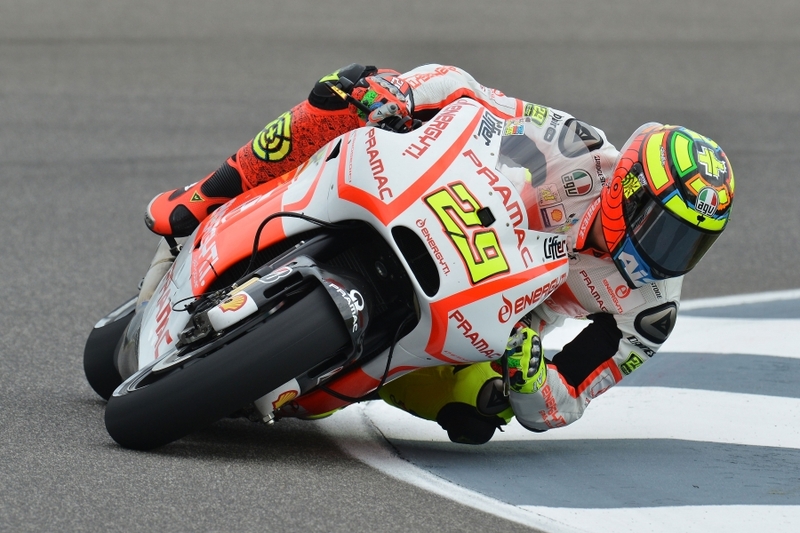 Crutchlow was second fastest in cool and cloudy conditions in FP1 this morning, with the Indianapolis Motor Speedway’s notorious lack of grip and bumpy surface making it hard to work on a set-up for Sunday’s 27-lap race. With more grip available and track temperatures increasing this afternoon, the British rider was able to improve his pace by 1.3s in FP2 to finish fifth fastest in an incredibly close fought session. Crutchlow’s best lap of 1.39.813 was just 0.311s off the best time set by World Championship leader Marc Marquez and the top 10 were covered by just over a second. Rookie Smith enjoyed an outstanding return to action at the legendary Brickyard venue today and after impressing with 10th position in FP1, he shone again in the second 45-minute session. Smith capitalised brilliantly on the improved track conditions to shave a massive 2.2s off his best time from this morning and a personal best of 1.40.240 moved him into eighth on the combined rankings. Smith was just over 0.7s off the fastest pace and less than 0.2s behind nine-times World Champion Valentino Rossi’s factory YZR-M1 machine in sixth position.